A recent cluster of automobile accidents along Montana’s Hwy 191 has rekindled concerns about state and federal management policies for our country’s wild buffalo. In just one weekend in early April, 15 bison were struck and killed by vehicles traveling along a short 10-mile stretch of Montana’s Hwy 191. Concerned citizens, including members of the Buffalo Field Campaign, are calling upon Montana’s decision makers to use this as a reminder of the very real stakes involved in developing a thoughtful management plan built around sound policies to ensure buffalo and human safety. In today’s nonstop news cycle, we’ve learned tofilter out the blitz of problems plaguing us. I had read about the BuffaloField Campaign (BFC) in literature where I work, in a Patagonia retail outlet. The BFC is the only group working in the field, everyday, to stop the slaughter and harassment of Yellowstone’s wild buffalo and to protect the natural habitat of wild free-roaming buffalo. I looked at the brochures, wished there was more to be done, and turned my attention back to my daily grind. The Buffalo Field Campaign’s mission is to stop the slaughter of Yellowstone’s wild buffalo herd, protect the natural habitat of wild free-roaming buffalo and native wildlife, and to work with people of all nations to honor the sacredness of the wild buffalo. 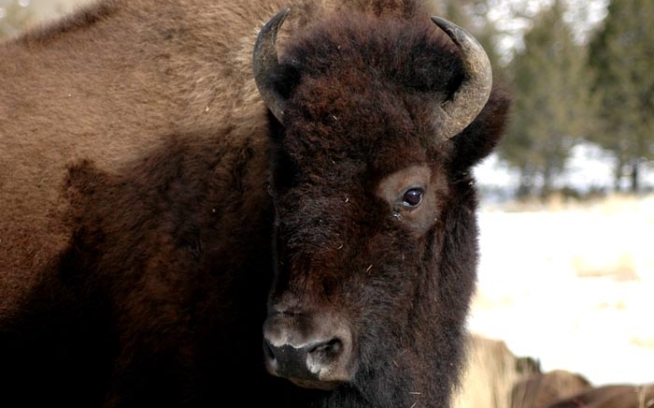 Through their literature and personal accounts from fellow employees who had volunteered for BFC, I learned that Buffalo in the Greater Yellowstone Ecosystem are not protected on their year-round habitat.Yellowstone National Park does not provide sufficient winter range for the resident herds of wildlife. Due to the deep snow, animals are forced to leave the park in order to find adequate forage for winter survival. When the buffalo follow their natural migratory paths – which invariably lead them outside the park – they enter a conflict zone with the Montana Department of Livestock (DOL). Local area cattle ranchers fear the transmission of brucellosis, a bacterial disease that affects livestock and wildlife, sometimes causing cattle to abort their first calf post-infection. While abortions have been documented in wild buffalo, such incidents are rare, and the impact of the disease on Yellowstone buffalo and elk is insignificant. 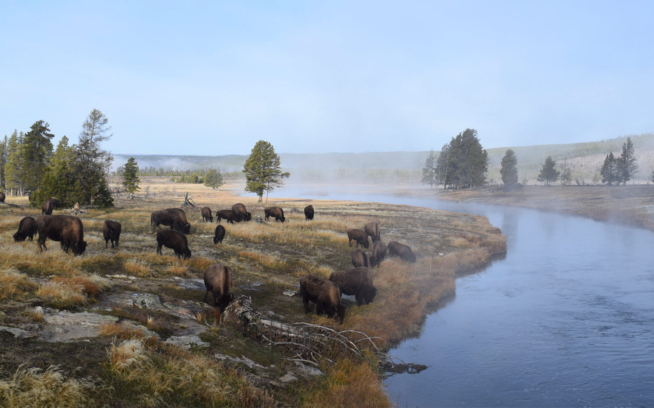 Brucellosis, which originated in European livestock, was first detected in Yellowstone’s buffalo in 1917 after some buffalo were fed milk from infected cows. There has never been a documented case of a wild,free-roaming buffalo infecting domestic cattle with brucellosis. Despite this, all buffalo that test positive for brucellosis are sent to slaughter. This includes bulls, even though transmission is thought to occur primarily (or only) when an infected female gives birth or aborts. During the winter of 1996-97, the Montana Department of Livestock (DOL) slaughtered almost 1,100 Yellowstone buffalo when they crossed the arbitrary park boundary and entered lands that fall within the jurisdiction of the MDOL. These killings, combined with deaths from the unusually severe winter, resulted in a loss of nearly two-thirds of the herd.In spring of 2002, when the Yellowstone buffalo population exceeded an arbitrary population “cap” of 3,000, MDOL sent more than 100 buffalo to slaughter without even testing them first. In 2003, the National ParkService—the agency responsible for protecting the buffalo and other Park wildlife—sent more than 200 buffalo to slaughter before any disease testing was conducted on these individuals. In the fall of 2006 I was fortunate enough to attend the Patagonia Tools for Grassroots Activists Conference. It was here that I met Stephany, media coordinator for the BFC, and a buffalo lover and activist. Her passion for the Yellowstone bison stoked that slow-burning fire I know is inside me but sometimes forget to tend to. We stayed in touch. The post-holiday months brought reprieve, and I headed to Hebgen Lake in April to experience what the dedicated volunteers for the BFC do every day. To say that their work is impressive is an understatement. Never have I seen such dedication, passion and pure love for a cause. Everyone who works for BFC does so on a volunteer basis. No one receives pay for their work, yet they spend all day, from sunrise until sunset, watching and documenting actions taken against the buffalo. This includes running patrols from cars, skis and snowshoes to protect buffalo outside the park. Tactics range from video documentation of the DOL harassing buffalo (chasing bison by helicopter, running them back into the park or corralling them into a trap to send to slaughter) to nonviolent civil disobedience.I drove ten hours to Montana, not quite knowing what to expect. The cabin was bustling with busy people when I arrived,moving in and out, talking excitedly about the latest movement of bison out of the park. It was just beginning. The spring plays out its beautiful role in the cycle, and wildlife everywhere are waking up, moving on, giving new life. The volunteer coordinators gave me the overview, and soon I was scheduled for an AM patrol.My 5 am wake-up call came the next day, breakfast was made and the patrols were out. We headed to Duck Creek Pond, a small body of water teeming with life:Sand Hill cranes, trumpeter swans, Canada geese and golden eyes. Where were the buffalo? We headed down Hwy 191, cars zipping past, and there they were. I connected with my first group of bison – bulging buffalo bellies ready to give birth and little yearlings from the past spring prancing around their mamas leading them to Horse Butte. We raced up and down the highway putting up the bright BUFFALO AHEAD signs warning cars and 18-wheelers to slow down for risk of hitting the buffalo. The buffalo follow the same migratory route that they’ve used for thousands of years and are ill equipped to deal with what—for them—is a very recent development: a high-speed highway that cuts directly across their path. As we raced around trying to warn the trucks and cars barreling past. I understood the rush that BFC volunteers feel. I finally felt that burn they know moving them to be here for the buffalo. In the three days of patrols, watching over these beautiful bison as they try and live in peace, I witnessed an incredible dedication from the people at BFC. They work for the buffalo from sunup ’til sundown, cook and clean to support one another and always know why they are here – buffalo. I thank them for the work they do and the chance to come and work with them. I encourage anyone who wishes they could do more, or who is simply curious about the Yellowstone Buffalo to come and stay in the cabin onHebgen Lake. You will be fed, chores and work will be given, and you will connect with something far greater than yourself. Meghan Sural is the Assistant Manager of our outlet store here in Reno, NV. She’s also a devoted wilderness steward. Though her roots lie in Appalachian soil, her heart roams free on the open deserts of Nevada’s vast wild (and unprotected) places. She kindly shares some soulful words with us here about her time spent volunteering for Friends of Nevada Wilderness.